Well-aimed snowballs: It's not too early to remind you to start watching how the U.S. political campaigns use social media, since elections always bring out innovations. The Wall Street Journal takes a look, noting that Hillary Clinton--with no official campaign yet--far outstrips other candidates in Facebook mentions. Está nevando, all of a sudden: It's 2015, and the New York Times is experimenting with translating certain stories into Spanish. 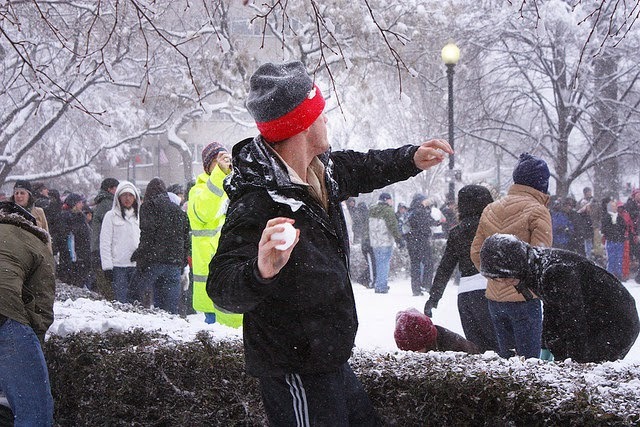 Will you be on my snowball team? Twitter's rolling out TweetDeck Teams to help you manage accounts with multiple posters. Poor visibility: This article on the digital black hole suggests that you may lose many memories--in the form of photos and other media--when social sites get updates. What are you doing to preserve them? Snow removal: Pinterest is getting rid of affiliate links. Just missed me: Earlier in the week, I posted about the latest in online video options and trends, including new players like Snapchat and Twitter, as well as what the stalwarts are doing to stay current. Lots of good data for you, plus a take on what your viewers are thinking as they look at your videos. The snow has drifTED: Seats are filling for What goes into a TED-quality talk, my pre-conference workshop at the Spring Speechwriters and Business Communicators Conference in Cambridge, UK, this April. The workshop will help you learn how to craft and deliver a talk in the style of TED, whether you're getting ready for a TEDx conference, writing a speech for someone else, or aiming to do a presentation in this popular style. Go to this link for more details on what's included, as well as a significant discount. The workshop is on 15 April, and the conference is 16-17 April. Please join me! It's like free hot chocolate at a snowball fight for me when I see you here on Fridays. Warm up and sign up for my free monthly newsletter, register for my workshop, buy my new ebook on moderating panel discussions, or let me know how we can work together in 2015 with an email to eloquentwoman at gmail.com.